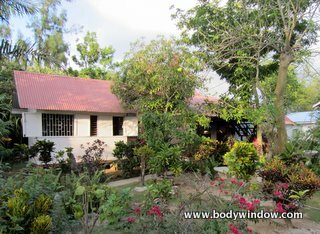 The Negril Yoga center is your yoga travel connection in Negril, Jamaica. 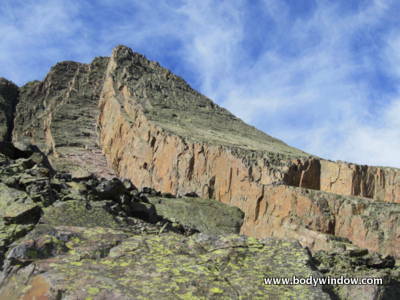 I could just as easily substitute the phrase, "yoga travel" for wandering in the above quote. 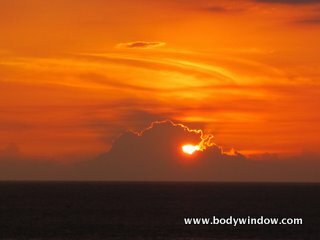 Yoga definitely re-establishes harmony between (wo)man and the universe, so if you wander AND do yoga the connection may be even greater. At least I think it is. 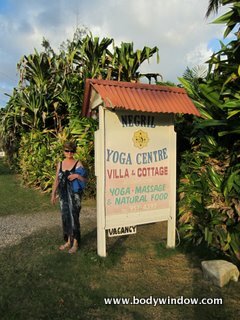 I am learning the beauty of yoga travel after traveling to the Negril Yoga Center in Negril, Jamaica. It is a funky-cool Negril Jamaica hotel. Seeing the world can take you outside your comfort zone. Wandering through another culture, even when they speak the same language, definitely is a learning and growing experience. Jamaica is no exception, as the different culture there can slap you in the face. However, traveling to yoga centers like this one eases the discomfort by connecting you instantly with others, within the common bond of humanity. Yoga travel can change the way you feel about being a "stranger." I was invited to travel to Negril, Jamaica by my sister, an opportunity that I pounced on. I had never been to Jamaica, a former British colony where the land was exploited for its ability to grow sugarcane. It is a beautiful land, lush and fertile, surrounded by azure blue seas. 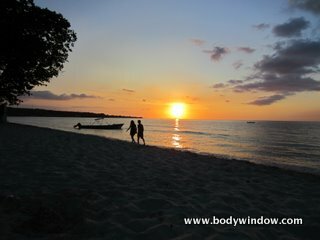 We stayed in Negril, Jamaica, in the Negril Yoga Center, just steps away from the famous 7 mile beach. 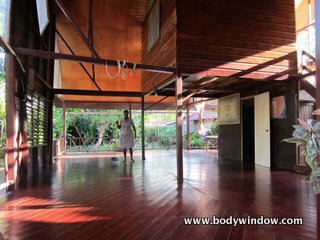 The Negril Yoga Center really is a funky and cool place. 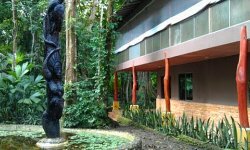 It is not a resort, by any means, but if you have a limited budget and wish to stay in a clean, well-run place surrounded by beautiful lush gardens this is your place. I felt very safe and comfortable here, which was important for two women traveling together! It is a great Negril Jamaica hotel, especially if you enjoy yoga travel. Yoga centers bring to you a much different atmosphere. The grand yoga hall is the first building that comes to view as you step inside the garden gate. Unfortunately, I don't have any photos of the daily yoga classes, because I was in them! The yoga classes were of the Iyengar style and the teacher I had was wonderful. We moved through the poses in a slow flow fashion, fully experiencing the meaning of our bodies in the pose. 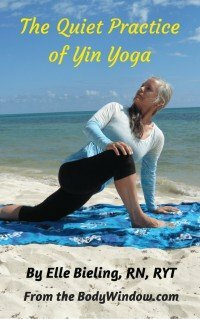 This style of yoga is what I love and the older, perhaps, retired teacher was perfect. A northern view of the 7 mile beach in evening light. 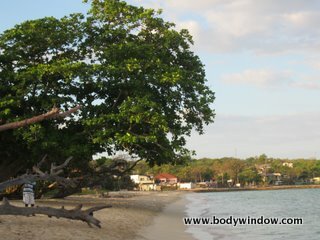 A southern view of the 7 mile beach in morning light. When staying in an off-the-beaten-path Negril Jamaica hotel you have the opportunity to experience the local color. Unlike in an exclusive resort where you are sheltered from the culture, self-arranged trips open your eyes to the reality of life in that culture. The Jamaican men are overly friendly and will approach white women every chance they can get. However, with some preparation and friendly advice from the Jamaican women, you can manage. I admit that traveling as two females presented some interesting challenges. We had to stay alert and use our heads when necessary. The bungalow where my sister and I stayed. More bungalows at the Center in Negril, Jamaica. 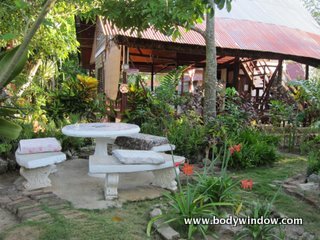 The gardens at the Negril Yoga center are lush with tropical flowers in bloom and towering palm trees overhead. The bougainvillea were especially lovely in February. The bungalows were scattered within the gardens. We met several parties who were staying there as snowbirds for most of the winter. There are community kitchen facilities, however, the food from the kitchen is inexpensive and delicious! Outdoor dining at the Center. Breakfast with the yoga hall in view. We had breakfast outdoors on these marble dining sets. You walk up to the kitchen and order your meal at the window. All the meals are freshly prepared by the cook. The Center kitchen with Annette the cook. Here Annette is preparing the callalo green, or amaranth as we know it. It is a delicious green that she chopped and added to my omelet in the morning. The dish was delicious and accompanied by the rich, mountain grown Jamaican coffee made for a wonderful meal. Interestingly, they usually add evaporated milk to their coffee, which I loved! I normally use milk and the concentrated milk suited me perfectly. Most likely, I would not have experienced this if I had stayed at a resort. 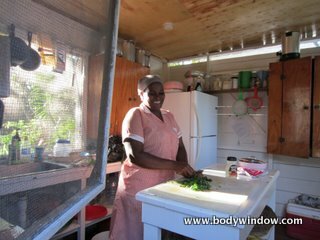 The cook was very friendly and more than willing to advise me on the in's and out's of Jamaica! I love to interact with the locals and she was happy to do so. As I wondered around the gardens of the Negril Yoga Center, this peaceful Negril Jamaica hotel, I looked upward towards the sky. 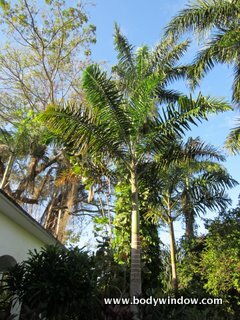 The palm trees glowing in the sun with the clear blue sky mesmerized me. I felt connected to this place, this paradise that was allowing me to have a little heaven on earth, if just for this moment. Yoga travel is growing in popularity and I can see why. 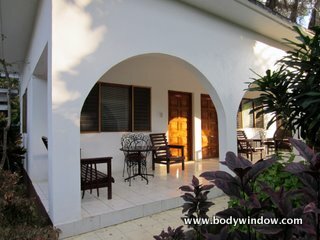 I would love to return to the Negril Yoga Center with a group of body-mind-soul friends to experience the place in full. 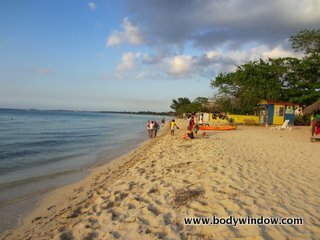 It is a beautiful setting on the beautiful 7 mile beach in Negril, Jamaica. For now, I can only recommend this Negril Jamaica hotel to you and hope you have the opportunity to experience it. 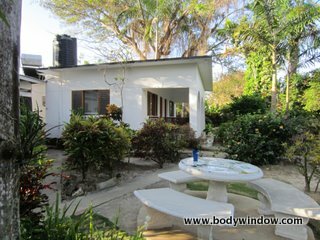 The Negril Yoga Center is there when you are ready for your own personal yoga travel!